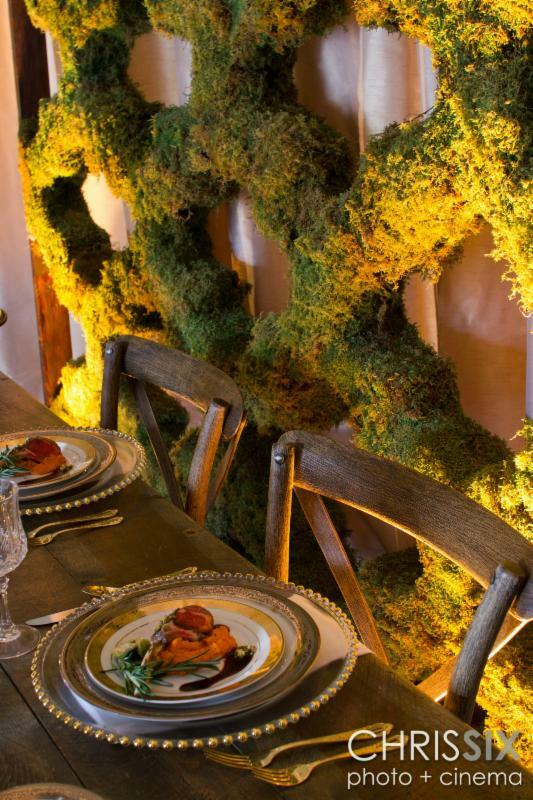 Although this tableau, created by the talented folks at Catering by Michael's and Event Creative is entitled "Rustic Luxe", it doesn't begin to convey how warm and inviting the table design really is. During the morning "inspiring creativity" session in our showroom with Matt Morgan, Designer for Event Creative and David Sandler, Executive Vice President of Catering By Michael's, the only thing missing was the creativity of Michele Grossman, one of Catering By Michael's top sales people who was unable to join in the fun that day. As Matt bounced from one creative idea to another, David knew his company could design the perfect complementary food no matter what the design. 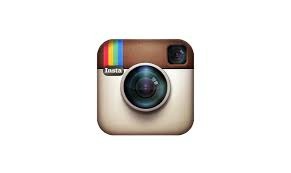 Catering By Michael's, with all their expertise, creativity and experience always gets the job done. Shown here on each individual place setting was what he settled on: a delectable lamb chop encrusted with pistachios, surrounded by a carrot puree and roasted brussels sprouts. One of the first challenges Matt tackled was creating a vignette that would look good in our showroom for a full month. 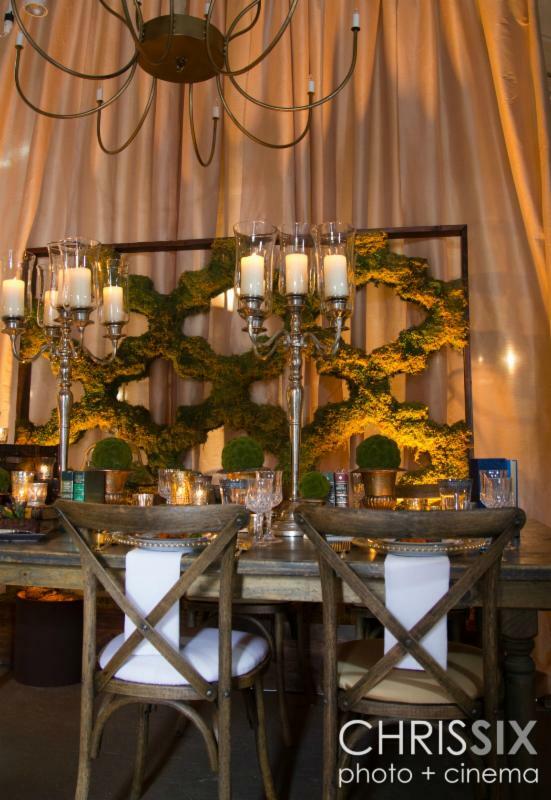 The moss wall used at Event Creative in different iterations for everything from a Cinco de Mayo party, to a place card table and for a sectioning screen in lounge areas is the perfect backdrop solution to our request. The intimate uplighting enhances it's textural feel. 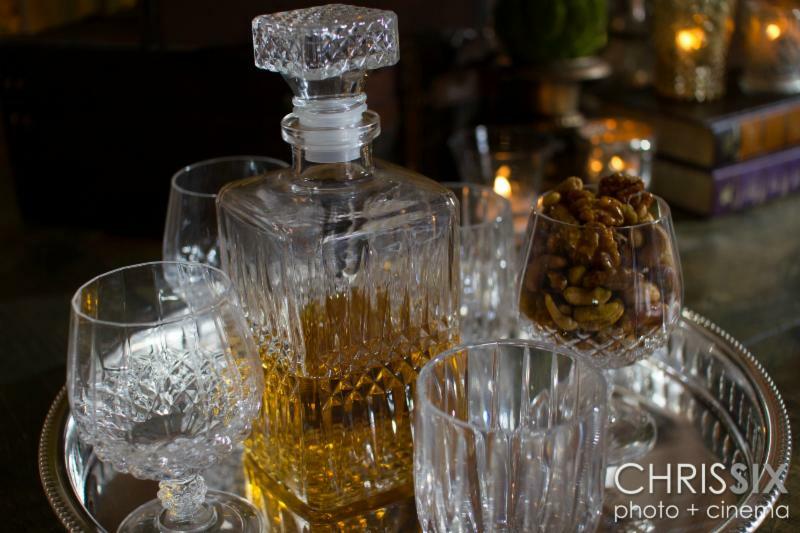 One of the details they chose as a natural fit for this vignette was one of our new decanters. Cut crystal conveys the elegant look of the table and emphasizes the importance of specialty drinks and all the "cocktailia" (bartender paraphernalia with which to prepare them). To stay on top of current industry trends, like the specialty cocktails, Matt emphasized the importance of keeping up with trade journals, Bizbash, is a favorite. David has been active in CaterSource for over ten years. He stresses not only getting ideas from the convention, but he believes building a network of catering contacts across the country is priceless. He has gotten so much out of the convention, he continues to go now as a speaker so he may give back to the industry that has provided him with so much. Matt describes his design "pulling out of your grandmother's closet" as a popular wedding request and, although it may look like a musty library, these "mixed look" weddings convey age and quality. Mixed metals and books certainly achieve that. We love all the decor mixed with our vintage suitcase risers. 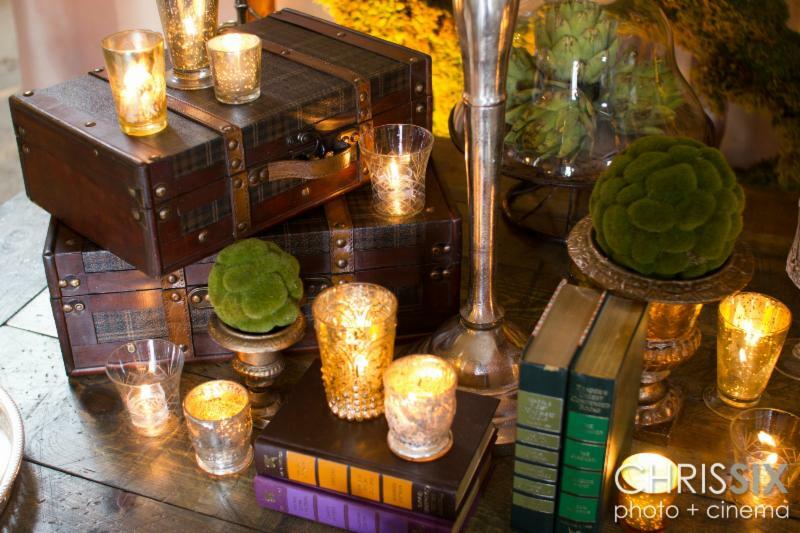 Notice how well our new gold and silver mercury 3" votives mix with the assortment of Event Creative's candle holders. 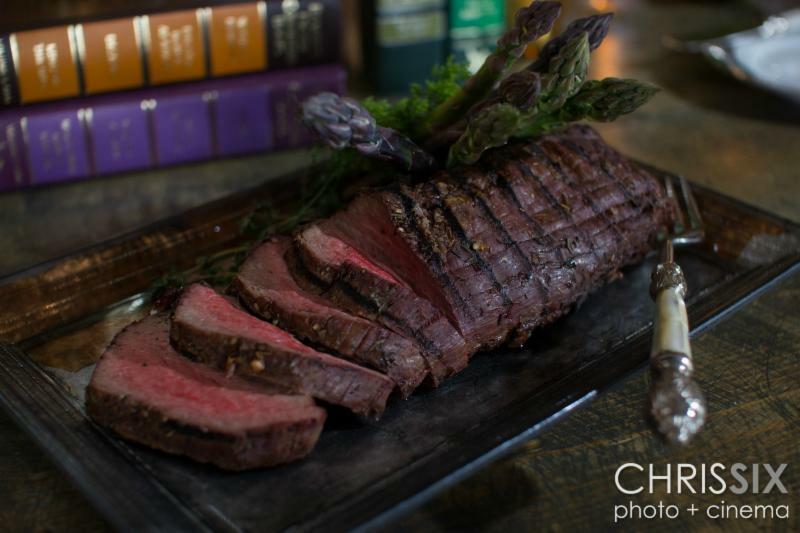 Here the popular family style trend evolves away from traditional white platters to our copper/silver rectangle as a way to showcase that gorgeous tenderloin. "Presentation is everything," David emphasized. We learned his full-time kitchen staff of 55 tests recipes and, equally important, participates in plate design. They hold internal "Iron Chef" competitions where the winner gets an extra $100. All are invited to compete. The dishwashers take it just as seriously as the sous chefs. 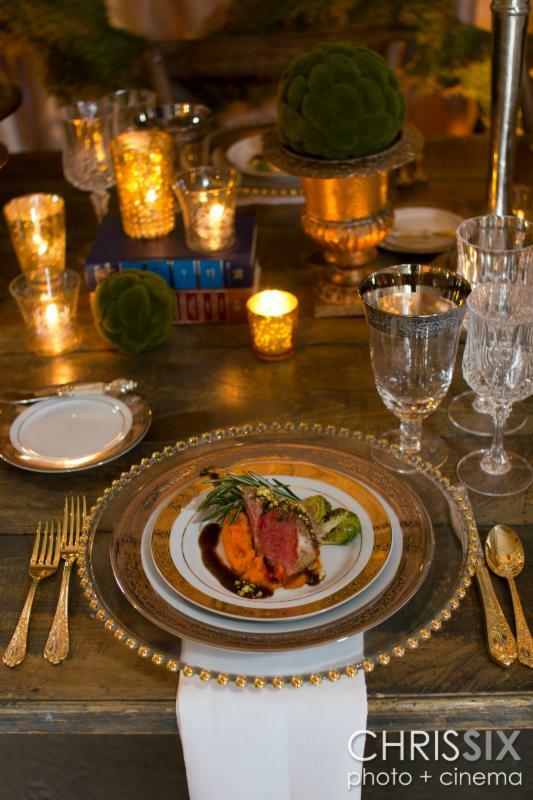 The contrasts created by all the crystal and the rough finished farm table and between the silver and gold metals were all captured expertly by our guest photographer, Chris Del Sesto, with his ability to highlight all the opposites together. We think you will agree it is the perfect vignette. Here's hoping all of your weddings this summer look as inviting as this one!